Began between 1959/1960 and 1961/1962. Issued 1949/1950-<1951/1952> by Bureau of Agricultural Economics; issued <1954/1955-1956/1957> by Agricultural Marketing Service. 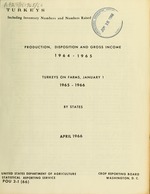 Description based on: 1961/1962; title from caption. Farm production, disposition, cash receipts and gross income, turkeys ..
9 percent advance in the Western States and 14 percent for the North Atlantic States. 1965 totaled 1,896.3 million pounds, up 5 percent from the 1964 production. with the previous year and the highest number since 1961.
unchanged between the two years. ed with 1, 795. 1 million pounds in 1964.
were 4,093,000 birds, up 8 percent over the 3, 782, 000 birds a year earlier. birds, 10 percent above the beginning of 1965. 1/ Combined to avoid disclosing individual operations. turkeys on hand January 1. Adjustments made for changes in inventory. Combined to avoid disclosing individual operations. raised and on hand beginning of year. 2/ Loss during the year of turkeys on hand January 1.
made for changes in inventory.